The majority of the world’s corporations are recognizing the need for sustainable development, good governance, environmental conservation, and social responsibility in their business practices. While the private sector has invested heavily in environmental conservation, there is much to be done to bring social responsibility into the forefront of corporate policies. Nowhere is the need for social responsibility more urgent than in the relationship between corporations and Indigenous Peoples. Private interests disproportionately impact Indigenous communities, and increasingly they negatively influence government policies toward Indigenous Peoples. Faced with these challenges, Indigenous communities have made significant progress in developing models for engaging with corporations that allow them to retain control of their assets. Industry leaders are finding that Indigenous communities can be amenable to corporate activity as long as it benefits the community and goes hand-in-hand with good environmental stewardship practices. Visit our Free Prior Informed Consent page to learn more. At the same time, the financial and reputational costs of ignoring Indigenous rights are mounting. Industry leaders are recognizing that work stoppage, budget overruns, negative press, and exorbitant legal costs have all resulted from companies trying to set up operations on Indigenous lands without the approval of our communities. Visit our Building the Business Case page to learn more. 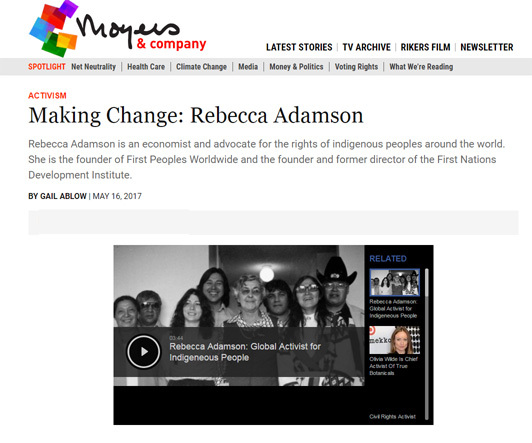 First Peoples Worldwide founder Rebecca Adamson has been advocating for Indigenous rights through corporate engagement for nearly 20 years. In 1994, she became the first Indigenous member of a mutual fund board when she joined the Calvert Social Investment Funds. 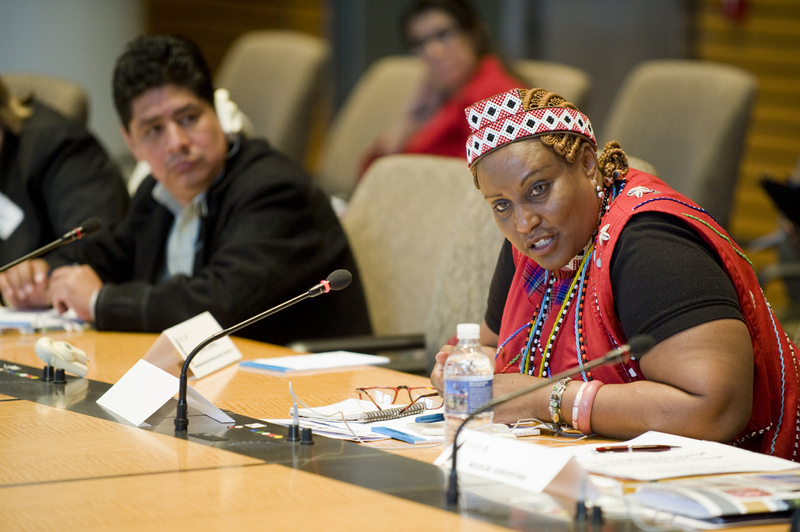 In collaboration with Calvert she led the creation of the Indigenous Peoples Investment Screen. Later to become the Indigenous Peoples Investment Criteria, this framework helped KLD Analytics and Calvert ESG to incorporate Indigenous issues into their research databases for investors. She then organized the Indigenous Peoples Working Group for shareholder activism, training over 600 hundred brokers, investment research firms, clients and investors in the use of the Indigenous Peoples Investment Criteria. In 2007, the criteria provided the framework for an unprecedented victory for Indigenous rights—over 90% of the shareholders of Newmont Mining voted to require the company to make efforts to reduce conflict with Indigenous Peoples. Today, the criteria is being used by companies worldwide. KLD Analytics, one of the first to adopt the criteria, has since become one of the largest investment research firms in the United States (MCSI). Today, corporate commitment to social responsibility is gaining strength. A World Bank study on Indigenous Peoples’ access to conservation funding found that corporations’ approach to funding development projects tends to be more reciprocal than that of NGOs or foundations. Communities reported that private companies are often better at consulting with and listening to neighboring communities, as well as more transparent in their practices. And more and more companies are recognizing that protecting Indigenous rights is vital to the survival, success, and sustainability of their businesses. First Peoples Worldwide is the first and only Indigenous organization to use finance- and market-based strategies to solve Indigenous issues. We are committed to bringing corporate operating policy in line with the interests of Indigenous Peoples, and to helping companies develop an operational model that recognizes the real social costs of doing business. Click here to view a letter signed by investors worth $125 billion in assets under management urging the World Bank to refrain from weakening protections for Indigenous Peoples in its Safeguards. Click here to view a letter to the World Bank from the Calvert Social Investment Fund Trustees. Visit our Bridging Cultures page to learn more.